To insert a PowerPoint presentation into a Word 2013 document, you’ll want to save your presentation as a video in PowerPoint, and then link to it from your Word document. You’ll need a video-based Web site to host the video. For this procedure, let’s use YouTube (www.youtube.com) – many video sites have similar features and functions, so use the site that you prefer. Upload your video to YouTube, following the site’s instructions. In YouTube, locate your video. Just below the video, click Share, and then click Embed. 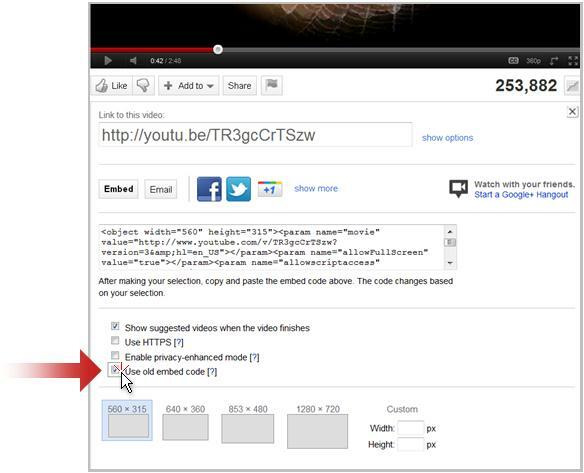 Check the Use old embed code check box, and then specify the format and size of the video that you want to link to. Copy the embed code shown in the Link to this video box. In Word 2013, on the Insert tab, click Online Video. Paste the embed code in the From a Video Embed Code box. Note: Remember that even though they are called 'embed codes', the original video will continue to be hosted on the web site, not actually inserted into the Word document. This means the person viewing the video from the Word document has to have a working Internet connection to watch it play.